Langston Kerman, an accomplished comedian and poet, performed one of his comedy routines in for Rider students. His jokes provided endless laughs during the performance, which was a nice “welcome back” for students after returning from spring break. 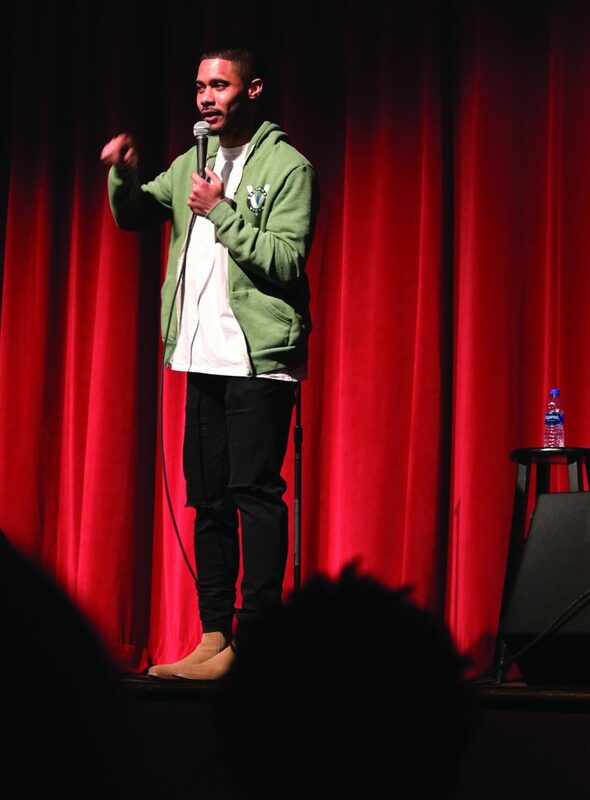 Rider students who needed a bit of comedic relief in their lives got it on March 25, when the Student Entertainment Council (SEC) prescribed a dose of Langston Kerman, the multi-talented comedian, who performed at the Bart Luedeke Center Theater. Kerman, most popularly known from his appearances on Comedy Central and HBO’s “Insecure,” delivered over an hour of hilarious comedy to an eager crowd. The audience ate up his material and had several chances to interact with him during the performance, which was quite rare for a comedy show. His audience interaction created a very immerse and fun-filled experienced as he told his jokes, the majority of which related to marriage and couples. This was because Kerman himself was recently engaged and his relationship was a large aspect of his life, one that he decided to shed light on through comedy. Born and raised in Oak Park, Illinois, Kerman graduated from Boston University with a Master’s degree in poetry. He jokingly told the audience to not do this, as it would be nearly impossible to ever obtain a job. However, in an interview after the performance, Kerman delved further into the truth behind this joke. Comedy wasn’t the only profession Kerman was drawn to. Kerman’s change of direction in his career path has evidently payed off for him, as he has become a successful comedian and gained a role as the character “Jered” in the hit HBO show “Insecure.” He is also slated to appear in a new show on Comedy Central titled “South Side,” a scripted comedy following two friends trying to make ends meet in Englewood, Chicago. Kerman has also authored many poems, making him a well-rounded individual comprised of various talents. As for students arriving back on campus for the last few weeks of the spring semester, Kerman’s performance offered more than just a few laughs. The Rider community can be on the lookout for more fun and entertaining events planned by the SEC in the near future.